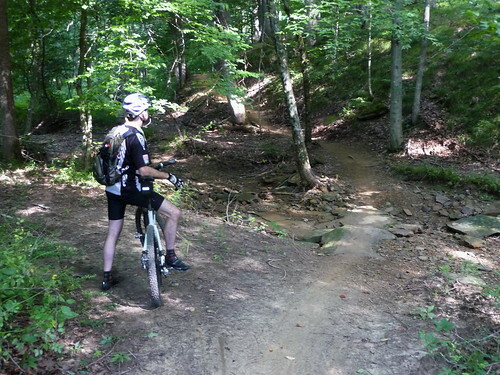 Since our ride was cut short on Saturday, Dave and I met at Brown County again on Sunday, to try again. This time, we had a successful ride. I took very few photos, and most of the ones I did take didn’t turn out very well. Once again, it was hot and humid and my camera lens seemed to be eternally fogged up. That, and my camera wasn’t as accessible as it usually is, when I ride on the road. We started out by riding the North Tower Loop, a good choice as it’s a fairly easy trail, with mostly gradual climbs and only moderate technical challenges. It’s the main trail I rode when I was first learning how to ride trails, so it also served as a good way of learning how to ride a singlespeed on the the trails. Frankly, it took me quite a while to find my groove. The climbs required a different rhythm from what I’m used to, and the on downhills I had to go extra slow because my brakes weren’t operating at 100% capacity. Try as I might, I could not get them adjusted quite right. My rear brake in particular just didn’t have much stopping power. So, on the downhills, I had to keep my speed down. If I got going too fast, I would have had a hard time stopping. Since I’m used to riding a front-suspension 29er on the trails, the rigid singlespeed was quite an adjustment. But after a while, I discovered that these trails just aren’t that rough, so I only really missed the suspension when I had to ride over a log or a rock, when normally, it would soak up some of the bumps. In terms of gearing, a few times I felt like the gearing was a little too high. But, there were times when it was just right. Some rolling hills in particular were a lot of fun as I made better use of momentum than I normally would. When I did find the flow of the trails, it was a blast. After the North Tower Loop, we stopped for a brief break on the connector trail, which is a wider, flat trail that takes you back to the Aynes Loop and beyond. On the singlespeed, I found myself out of breath more often, since I couldn’t switch to a lower gear and spin up the hills. Thankfully, there were very few sections on this trail that were very steep. Most climbs were gradual enough to be quite doable (actually, they were ALL doable, just some more than others). After that, we had the hardest climb of the ride, up part of the Aynes Loop, counter-clockwise. This is the easier way up Aynes, I think, but it’s still a long climb, and I have to say, it was pretty damn difficult, without any lower gears. Hard enough that I almost … almost had to stop to catch my breath partway up. But I made it. Finally, we got to the Green Valley Trail, which Dave and I had only partially ridden before, when it was still a work in progress. I was so excited to ride it in its entirety. I really can’t say enough good things about this trail. It might become my favorite trail in the park. It has some wonderful flowing downhills, tricky but fun climbs, and enough technical challenges to keep you on your toes, including a few that test the limits of my ability, but not a single thing that’s unridable. And the scenery is great, from ridgetop views to creekside and back again, frequent views of other parts of the trail from across a ravine, and even glimpses of a lake. By this time I had found my stride on the singlespeed, and while as I said, I was slow on the downhills (not due to gearing, really, due to braking limitations) I felt faster on the climbs, at times. In fact, I did better on some of the more technical sections than I had on my 29er before! I was pretty surprised by that development, but in this case, I had no choice but to just tackle some of the tricky parts, rather than getting into some stupid-low gear and approaching at too low a speed. The photo below illustrates one really fun part. You come down a hill, then reach a creek in the bottom. The trail crosses the creek on some rocks, and there’s a twisty, narrow trail on the other side, which you use to climb up away from the creek. I almost stalled on a short, steep section here, but I managed to keep rolling. It was a blast. The Green Valley Trail also has a significant amount of climbing. A couple of different times, I stopped at the top of a hill to catch my breath, especially since the day was heating up. I really had to slog up some sections and I found the barend sections of my handlebars quite helpful for this. All in all, it was a great ride. 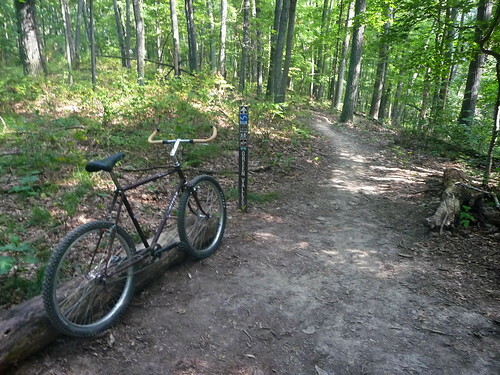 Only about 10 miles, but 10 miles of hilly singletrack, on a rigid singlespeed, gave me quite a workout. It was incredibly fun, and I can’t wait to get out on the trails again. Glad the bike is working for you. Have fun! By the way, no worries on that rear wheel I gave you. It was my pleasure to send it to you and it is yours to do what you please. As long as you are riding and blogging, it’s all good.